Jeffrey Welch's Blog: Is That Dog Slobber Normal … Or Something to Contact Your Vet About? Is That Dog Slobber Normal … Or Something to Contact Your Vet About? The post Is That Dog Slobber Normal … Or Something to Contact Your Vet About? by Jennifer Lesser appeared first on Dogster. Copying over entire articles infringes on copyright laws. You may not be aware of it, but all of these articles were assigned, contracted and paid for, so they aren’t considered public domain. However, we appreciate that you like the article and would love it if you continued sharing just the first paragraph of an article, then linking out to the rest of the piece on Dogster.com. Dog slobber is a normal part of being a dog parent … right? While dog slobber is — in most cases — an ordinary occurrence, there are some unique instances when too much dog slobber might indicate a medical issue. So, how can pup parents tell the difference between what’s normal dog slobber … and what’s not? There are a few things that may play a role in the amount of dog slobber your pup produces — like his breed, excitement over a toy or food or a medical ailment. Here’s what you need to know about dog slobber! Is that dog slobber normal — or something to be concerned about? Photography ©vikarus | iStock / Getty Images Plus. First, how often does your dog slobber — generally? If you seldom notice your dog drooling and then all of a sudden over a two-day period, you notice an intense amount of increased dog slobber, that’s something to take note of. If your dog’s slobber levels have drastically changed, alert your vet. Dog slobber is normal in all breeds, though some exhibit it more physically than others. Breeds like Bloodhounds, Newfoundlands, Saint Bernards, Mastiffs and Bernese Mountain Dogs have reputations for being particularly drool-y. If you have one of these breeds of dogs, then a significant amount of dog slobber is probably normal. More on that later! What usually causes dog slobber? Things like holding a tennis ball above your dog’s head or preparing her food over the counter might make her drool. Why? Because she’s gearing up for something that makes her happy. If she knows you’re about to throw a toy for her to retrieve or place food in her bowl, then she’s likely to get excited. Hence the drool! When does dog slobber signal a concern? The above are examples of normal dog slobber. However, there are some cases in which dog slobber indicates something else going on entirely. Some dogs may drool when they are anxious, even if they are not regular, frequent droolers. If your dog’s drooling is coupled with another one of the symptoms associated with anxiety — dilated pupils, excessive panting and tensed muscles — then your dog might be stressed. If the dog slobber is due to anxiety, the drool (and the anxiety) will likely discontinue once the stressor is removed. Typical stressors include the adoption of a new puppy, a thunderstorm, the introduction of someone new, home renovations or another new change. Excessive dog slobber could also signal issues like a dog tooth abscess, heatstroke, periodontal disease, mouth irritation, a blockage, nausea, car sickness or a neurological condition. 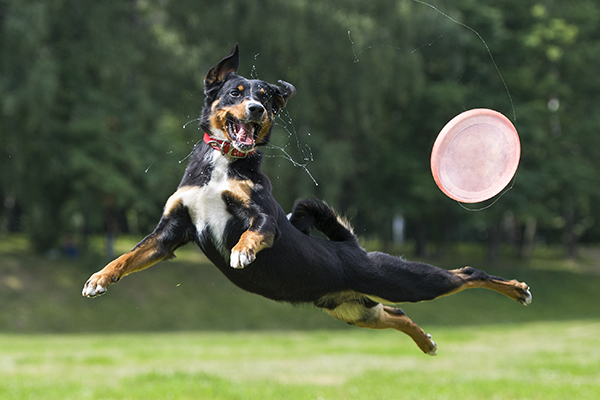 “It could be a sign of a neurological condition, in which the nerves in the face don’t work, or a blockage in the esophagus caused by something like a bone,” explains Dr. Ann Hohenhaus, DVM, DACVIM, a veterinarian at the Animal Medical Center in New York City. Drooling is usually only a medical concern if it is paired with other symptoms. If your dog appears hot, is excessively panting, won’t eat, is vomiting or experiencing diarrhea, consult your veterinarian immediately. How can pup parents mitigate dog slobber at home? Keep a watch on what your dog is eating. Oftentimes, if a dog gets into something he shouldn’t — like the trash! — an indigestible object might cause tummy upset. In turn, it can cause some excessive dog slobber. Likewise, make sure not to keep any plants around the home that are noxious to dogs. When dogs suffer from an allergic reaction to a poisonous plant, they may drool excessively and then get sick. Keep dogs away from pine needles, holly, poinsettia, lilies, chrysanthemum and more. Read more about poisonous holiday plants for dogs and plants in your garden that might be toxic to dogs. If the dog slobber is due to anxiety or sickness in the car, mitigate this by acclimating your pup to the car. Work your way up to driving your dog around the block. Brush your dog’s teeth! Sometimes, excessive dog slobber indicates periodontal disease or an abscess. But these are easy ailments to prevent. All you have to do is brush your dog’s teeth at least once a day. Scientifically, how does dog slobber work? As noted, dog slobber is sometimes a natural way of life for pups. Mostly, it’s in their biology as in, the way dogs’ mouths are shaped. Dogs’ mouths also have mucous membranes in their mouths and the biological reason for saliva is to moisturize those membranes. With a whole lot of spit and not many places for it to go (not to mention a loose upper lip), it’s no wonder a lot of it ends up pooling around their mouths or on the floor! “Saliva pools in their cheek pouches, and when they shake their heads, the drool flies,” says Dr. Hohenhaus. What breeds/types of dogs are more likely to slobber? As mentioned previously, some breeds are just predisposed to dog slobber. This includes breeds like Bloodhounds, Newfoundlands, Saint Bernards, Mastiffs and Bernese Mountain Dogs. Short-nosed or brachycephalic breeds are sometimes susceptible to drool as well. This is because they are more likely to get heat stroke, which can cause slobber in pups. These breeds include Boston Terriers, Boxers, Bulldogs and Pugs. If you have one of the aforementioned breeds, make sure to note their regular drooling habits and alert your veterinarian if anything changes drastically and over a short amount of time. Thumbnail: Photography ©fongleon356 | iStock / Getty Images Plus.